Well, it may be holiday time for many people, but it hasn’t been for us. We’ve been up to (and past) our eyeballs in work, particularly graphic design work, for the past several months. One of the items we’ve been working on is this. 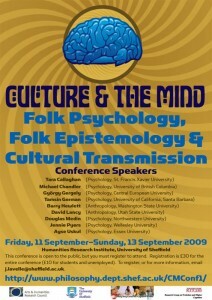 The “Culture & the Mind” Project assembles individuals from a wide range of academic fields to investigate different subjects. This year the focus is “Folk Psychology”: what we, in our everyday lives, do when we attribute beliefs or desires onto other people. 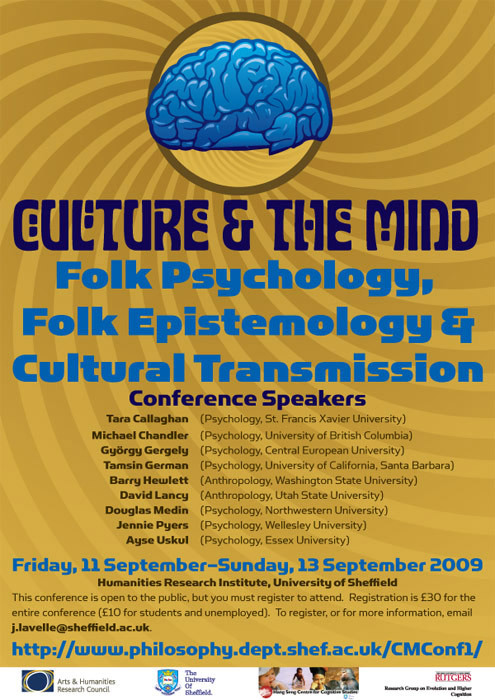 One of the questions the conference (and the Project in general) will attempt to do is to examine what aspects of folk psychology are innate, and what change depending upon one’s cultural upbringing. The client had a great desire to have fun with the poster, in particular to hark back to 60s & early 70s design. I took the opportunity to quote that, but also to pay homage to one of my all-time favourite graphic designers, Steven R. Gilmore. You can only go so far quoting Jefferson Airplane & Skinny Puppy posters, though: psychedelic typography & brain imagery act as visual hooks to make the viewer take a closer look at the content of the conference.